Answer: The big deal is that Mars and Earth are passing each other in space, and that means Mars is much closer than usual. The bigger deal is that, of all the places they could pass, this one is very close. Earth’s orbit around the Sun is nearly a perfect circle. Mars’ orbit, in contrast, is more of an ellipse. The diagram exaggerates the geometry to help you visualize the difference, and is not drawn to scale. Earth takes 365 days to go around the Sun, but Mars takes 687. Where they pass changes every orbit. The two extremes are shown above. 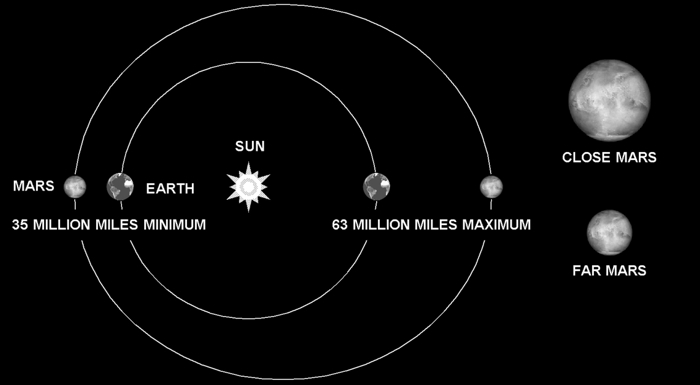 The difference between 63 million miles and 35 million miles is significant. When they pass at the close point Mars appears 80% larger than it does at the far point (see insets). This time around, Mars will be 43 million miles from Earth. Not the closest ever, but certainly far closer than average. Closest approach occurs on October 30th, but the view will be awesome for several weeks before and after that date. To the eye, it will be a very bright orange-red dot. If you observe Mars through a telescope you’ll see surface features, the polar cap, and maybe even some atmospheric effects like bright clouds or dust storms. By the way … there’s been this hoax circulating around the internet for many years now, proclaiming that Mars will appear “as big as the Full Moon.” I get questions about that all the time. Trust that Mars will never appear that large. If it ever did get close enough to appear that large, we’d have some serious problems.